Hard Rock Stadium, home to the Miami Dolphins, University of Miami Hurricanes, Orange Bowl, the Miami Open, Super Bowl LIV and the 2021 National Championship Game, recently underwent an estimated $500,000,000 stadium-wide renovation. The renovation included a state-of-the-art open air canopy with four spires helping to suspend the canopy 375 feet in the air. Architectural designs included the use of LED lighting to illuminate the underside of the canopy and to light the four sides of each spire on the canopy roof. With the initial LED lighting design proposal coming in significantly over budget, Dolphin’s ownership turned to Innova Energy Partners (“IEP”) to value engineer and redesign the architectural LED lighting proposal. The team at IEP was able to eliminate the need for 50% of the proposed lights while significantly improving photometric results. The innovative approach led to a steep reduction in material and installation costs. Additionally, IEP proposed and implemented a fully integrated control system that not only provided the ability for on/off and dimming control of the light fixtures, but also allowed for color changing of the RGB LED fixtures across the full spectrum of color. 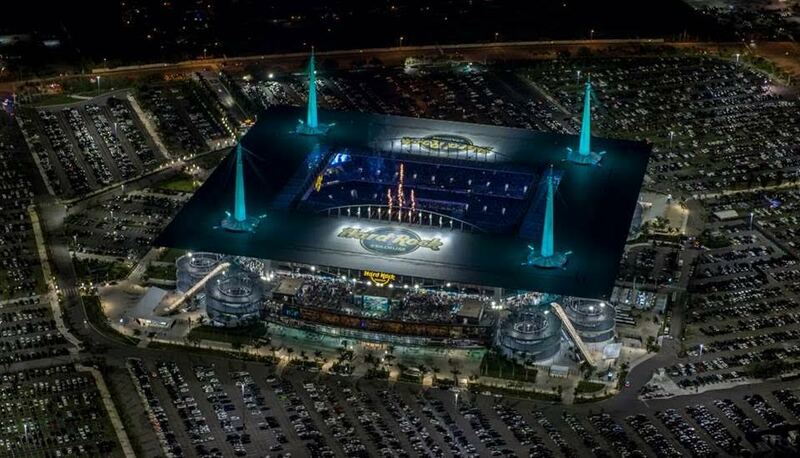 The team at IEP provided Dolphins’ ownership with a compelling LED lighting design proposal to illuminate the underside of the canopy. In order to provide a cost effective design within the proposed project budget, IEP elected to use a combination of both white and RGB LED lighting fixtures. In total, 104 white and 192 RGB LED lighting fixtures were used to illuminate the underside of the canopy consuming only a total of 45.8KW and 17.6KW respectively. The upper and lower spires were designed not only for structural purposes, but also as an aesthetic enhancement to each corner of the Hard Rock Stadium. IEP utilized a combination of white and RGB LED light fixtures to illuminate the four sides of each of the four architectural spires. The lower spires required 60 white and 60 RGB LED fixtures consuming only 12KW respectively for each design. The roof level spires required the use of 64 white and 112 RGB LED lighting fixtures consuming only 16KW and 35.8KW respectively. To enhance the illumination of the existing helix and provide for brighter, more energy efficient lighting, IEP replaced 512 96W 8 foot fluorescent fixtures with 55W 8 foot LED linear fixtures. In addition to the helix canopy lighting, IEP also replaced the 48 existing 400W metal-halide area lights with 150W LED lighting fixtures. To complete the Hard Rock Stadium architectural and facade LED lighting project, IEP installed a customized, fully-integrated lighting control system. Each LED lighting fixture is able to be fully controlled using a state-of-the-art software program installed onsite at the Hard Rock Stadium. With the ability to seamlessly switch back and forth between white and RGB LED lighting or other countless combinations of white and RGB lighting settings, the control system allows for flexibility and creativity among stadium engineers to provide the ultimate fan experience for any stadium event.